Before driving to the museum, we visited the Embassy of The Sultanate of Oman and met with the Charg’e d’affairs Salim Adbulla Al Alawi in the Embassy’s new building. Stepping into the court yard, we almost felt as if we were already in Oman as the building is designed with many of the unique features of the country’s architecture including intricately carved wooden doors and windows and an Omani style garden. Mr Al Alawi was delighted to receive a copy of the 101 guide and wished us a successful tour, admiring the images of Oman on our two cars. 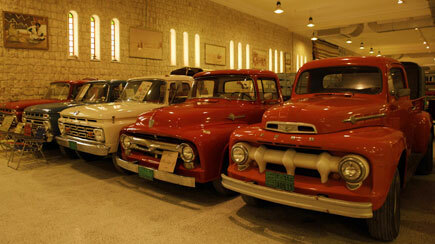 Next, the team drove 25km out of Doha to Sheikh Faisal bin Qassim Al Thani Museum. This museum houses the private collection of Sheikh Faisal Bin Qassim bin Faisal al Thani, collected over a 47 year period. Considered by many to be one of the best museums in Doha, it is home to 1000s of interesting and rare exhibits. These are housed in 12 halls in a building designed to resemble a fort. 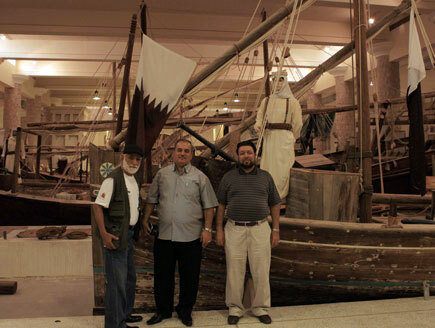 There’s furniture, carpets, fossils, costumes, vehicles, jewellery, dhows, weapons, old photographs, maps and much more. In fact you could lose yourself for a whole day there. The collection includes the smallest and the biggest Qurans in the world, an Ottoman example of the cloth that covers the Kaaba at Mecca, and a 600 year old carpet woven with silver and gold. Mr Al Dulaimi told us that the Museum is open 9am to 6pm by appointment only, closed Friday and Sunday. We recommend you call 55691406 to arrange a visit to this fascinating place. Bring your own refreshments and, if you’re a large party and book in advance, you may be able to use Sheikh Faisil’s majlis. Sadly we had to leave the museum having only scratched the surface of its amazing contents. Thankfully Mr Al Dulaimi gave us each a souvenir copy of a book on the museum’s Islamic art collection which we can read at our leisure. We will certainly add the museum to our list of 101 things to do in Qatar and look forward to returning for a closer look. The team left Doha for Abu Dhabi in the late afternoon to pick up new team member Eleni, arriving from Greece.